Interactive and smart display system of an intelligence building is in a fast growing. 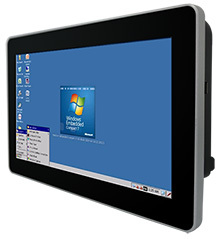 Winmate 10.1" Multi Touch Flat Panel PC is designed to fulfill the needs of this growing market. Winmate 10.1" P-Cap PPC is suitable for home automation and room management systems, and can be used in office, campus or conference center. By connecting to a centralized database, it can provide real time update for booking status and available schedule, or perform as a synchronous display in meetings. Easy to maintain and clean. The glass cover lens provides a great protection from scratch, and edge to edge design reduces the gap for possible accumulation of dust and liquid. True flat design also gives a slim and elegant appearance to the device. Projected capacitive touch supports 4-point multi-touch and can be easily controlled with fingers, enhancing the ultimate convenience and allowing users to enjoy intuitional experience when using the device. PoE provides both data and power connections in single Ethernet cable, reducing cables needed and thus simplifying the hardware installation. In addition, using a PoE infrastructure enables centralized power management, providing a cost efficient solution for access control and home automation application. Winmate 10.1" P-Cap series PPC available with its fanless cooling design, providing high performance and low power consumption to fulfill the requirements in industrial application. Winmate 10.1" P-Cap series products supports front IP65 sealing, protecting the device against possible damages from outer dust and water splash (front side). Not only slim, stylish, but also rugged, The design of Winmate 10.1" Multi touch Panel PC and Display is simple and elegant with round corners and curved back cover. Various types of mounting solutions such as panel mount, stand, VESA mount, Winmate VESA bracket mount, and front side wall mount make this 10.1" product easily mounted under different environments. Our Panel PC is built with latest technology such as the 720MHz version of TI Cortex A8 processor. The device comes with onboard 512MB DDR memory, 1GB flash storage, four standard USB ports, a RS232/422/485 serial port, and one RJ45 10/100/1000 mbps LAN support PoE function. There is also a micro SD Card slot. The device is also designed to meet tough industrial environment requirements for performance, low power consumption in a Panel PC form factor system.